Good morning crafty friends! It has been a productive week for me and I am walking more than ever. This week I got caught up on all my mailings for Day of Giving Friday. I have six cards here that are boxed and ready to go, just waiting for the winner to claim them. Please check the name list found at this link –>Giveaway Winners<– and scroll down, there are cards that have not been claimed since March of this year and I’d love to send them out. Today I’m sharing a new card that is up for grabs in our giveaway today. For my card I started with a lovely embossed background using Spellbinders Overlapping Circles. I framed the card using Spellbinders Pierced Rectangles and planted a decorative border at the top using Spellbinders Deco Duality. The sentiment was stamped on layered Spellbinders Standard Circles Small and then trimmed to fit along the bottom. My favorite part of the card is the flowers; I used Spellbinders Stack and Fan Flowers. For these flowers, the eight petals are connected together using a brad on one end then – I spritzed them and scrunched them to give them a different look connected the holes on the other end of each petal to form the loop. The petite spiral flowers are made using one of the petals, then I used the same die, the petals for the Stack and Fan Flowers, to make the swag along the bottom of the card. My goodness, that was one of those things that once done, a zillion ideas popped into my head about making these swags! I added greenery to the flowers using Spellbinders Floral Berry Accents. For new readers, every Friday it’s my pleasure to give away a card. The card goes to a randomly picked reader (worldwide) who leaves a comment in our conversation. Want to know more about Day of Giving, here’s a link to my FAQ’s just check out #11. You can check to see if your name is on the list of winners HERE. For your comment: What words of hope can you share today? Accessories: Spellbinders Overlapping Circles. Spellbinders Pierced Rectangles, Spellbinders Deco Duality, Spellbinders Standard Circles Small, Spellbinders Stack and Fan Flowers, Spellbinders Floral Berry Accents, Recollection Pearls. Thank you so much for stopping by! I’m heading into a crafty week so I know I’ll see you soon! The card you give away today is gorgeous, Becca! Wow such a gorgeous card, so much detail in all the layers, its just beautiful Becca. The sentiment is just perfect. I hope this finds you well, you seem to be back on your feet again which is good news. Lovely card today and everyday. I’d love a chance to win it. Your card is beautiful Becca – as always. Your gift is such an inspiration to all who have the privilege of seeing it – whether in person or on line! 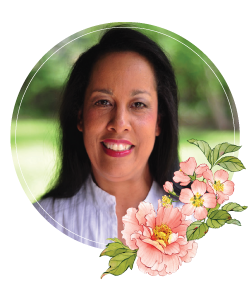 My dream – and prayer right now is for my husband to peacefully go on to Heaven where I will one day meet him. I know this decision is in the Lord’s good timing and the days are short before this happens. Praying this is the way he will go. I have not made a card using a “frame” Your’s is so nicely made. My words of hope are from my confirmation verse (59 year’s ago) which is Matt 28:20 – Lo, I am with you always, even unto the end of the ages. In the KJV it is even unto the end of the world. I went to Africa to do nursing a few years after this, and remembered that verse because I thought I was at the end of the world. But it is the hope I have that Jesus is always with me. Especially beautiful card today, Becca. Glad to hear the foot is doing better. My words of hope is the Lord only asks you to take on what He thinks you can handle. I live my life under this hope. I also hope that our Nation will be at peace very soon. God Bless. What a gorgeous card here once again Becca. I love the soft look and the romantic feel to it. Just soooo beautiful as ever. Wow, Becca, when I opened your blog, this card took my breath away. It’s absolutely stunning! What words of hope can I share today? – well some people say time heals but I say time will help you cope better with a loss which you can never forget. Time gives you the opportunity to move on, while still remembering all the love you shared. What a lovely card. I love the sentiment as I am in the process of setting my website and online store up after Dreaming about it since 2004. This is a very beautiful card and co;our Becca. My words of hope , Pray , God will always watch over you and all loved ones. Gorgeous Card Becca. So good to hear that your foot is doing so much better. Hope your house has been totally restored by now as well. My words of wisdom for today: No matter how bad things seem to get, just take a look around and there are always many out there who are far worse off. Say a prayer and keep the faith and knowing the man upstairs works in mysterious ways. Trust in him. OOOooooOOO! I just love this card!!!! The flowers are fabulous, and I also love the creative layout. Actually I also love the color, too. Ok. I love everything about this card. So fabulous!!!!! Hi Becca, This is a stunning card, especially these fabulous flowers !! My ‘Words of Hope’ are for ‘Peace in the World’, I pray for this every single day. So glad you are feeling lots better, enjoy your weekend. We are doing a Car Boot Sale at our Church tomorrow, this evening we got all the Church’s items set up in our School Hall, tomorrow morning we have to set up for all the other people who want a table inside the School or want to sell from their Car Boot outside. It is a very busy two days but hopefully we will get some much-needed funds for our Church heating. 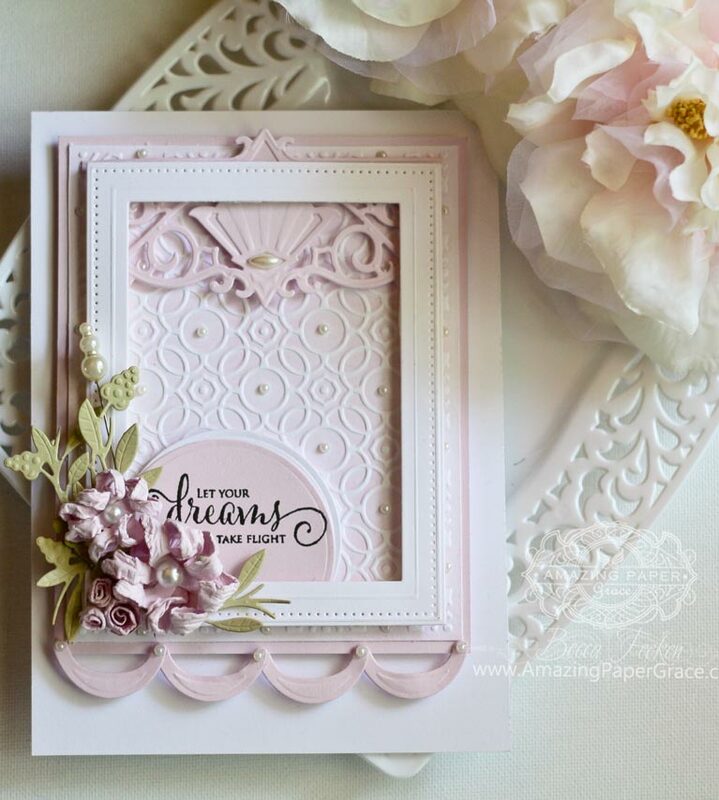 Another gorgeous card how do you come up with these ideas for cards, they are stunning. Stunning card Becca. I love it when you use a stick pin. Around every bend, there is a new tomorrow. This is the most beautiful card, and what a brilliant idea to make swags from the flower petals. I love it. Words of hope today and every day are:- The Lord is my shepherd, I shall not want. Your card is so delicate and pretty! Love the flowers and shabbyness you gave them. The card for this Friday is quite lovely and I really like the fantastic flowers you crafted from your Stack and Fan Flowers Spellbinders set. 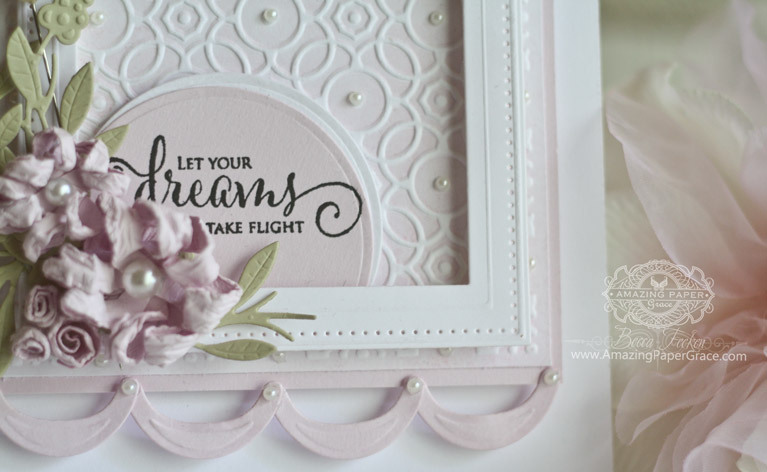 Using the set to make the scalloped border on the bottom added a great touch to the card. My words of hope: Even the DARKEST of times can be survived in the company of loving, caring friends; JOYOUS times shared by those same friends are multiplied a thousand times because they appreciate the journey taken. Take care of yourself. May you always be surrounded by loving and caring friends and family. I have been really blessed by Beth Moore’s series called He Is. It is so wonderful to be reminded that God is present and powerful right now. He has the power and desire to change our thoughts and attitudes and to bring peace the very moment we need Him. Dear Becca, this is a beautiful card, I love it. My words of hope and encouragement – God will never fail us!!! Good morning Becca, glad to hear that you are up and about!!! Your card today is gorgeous and the scallops on the bottom is ingenious you clever girl!!! I agree with Doreen, and also be very grateful for what you have!!! Be kind, caring and gracious to someone and in return you’ll feel such inner peace! Love that Overlapping Circles embossing folder you used on this beautiful car, and all the lovely details! All pretty and pink today! Lovely card. Hmm, what word of hope. Choose to believe that most people always do their best – it’s just that (like ourselves) some days, their best is better than others. Giving grace on those days is a good thing. sophisticated and at the same time so little girl feminine. Always a feadt to the eyes. “It was then that I carried you”….do you know where this line came from? What a spectacular card, Becca! And I just love those swags! Genius! So glad that you are able to walk more and get around now. That is such good news. Oh, Becca, I LOVE it when I’m looking and looking at an ingenious element of one of your cards (which I find to my delight OFTEN :) ), thinking “what IS that, and how did she do it” about that bottom swag layer, and how COOL was that!!! I own many of your dies and stamps, they are just to my taste and your sentiments address so many that I wanted, and we share the same spiritual heritage too. :) So I was THRILLED to realize that I own that flower set and I can try that. THANK YOU!!! I am always fascinated by the flowers you create, I love flowers myself and wish I was a much better colorist for one… :) I love creating my own take on flowers too, it pleases me to no end to create something on my own I haven’t seen before. And of course sometimes all I create is a muddy mess, but other times–the joy of creating something really pretty and different is wonderful! Wishing I had the ability (physical) to do that more and to create cards more. Hopefully when my craft room is totally reorganized, I’ll be able to spend a lot more time in there, can’t wait! How sweet! Who’d’ve thought the swag was from a flower leaf! Genius! Little late for my comment!! Was looking back @ posts I had not done found this one & absolutely adore it!! Always enjoy the flower tutorials they are so helpful and not so time consuming ! Hope u r doing well.